Q: I’m no tree expert, but I just had two palms installed, and the twine around the fronds was removed right away. Shouldn’t it be left on until the palms are established? A: You may be confusing twine-wrapping for wood braces that are positioned against the trunks to stabilize palms. Wood braces typically stay on for several months until a palm is established. 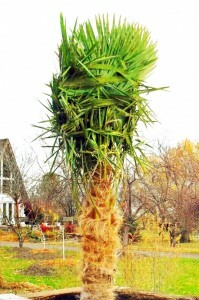 The twine around the leaves of a palm should stay on while the tree’s being transported, then removed immediately after it’s properly installed. Some people think twine should stay on a transplanted palm until it naturally breaks, or for six weeks after planting, or even for the entire first year. Q&ARTISTREE: IS THERE SUCH A THING AS AN AUTOGRAPH PLANT, AND IF SO, WHERE DO I SIGN?